His dog was dying. Hudson wasn’t any old dog, he was beloved. A gentle soul — fun, funny, with a sweet disposition. I knew he would be sorely missed. Bud and Karl went up mid-morning to help dig the deep hole. Peter had chosen a spot along the trail he used to walk every day with Hudson. Earlier in the week, when Peter had learned about Hudson’s cancer, he had asked Karl to come play soccer with Hudson, one of the dog’s favorite activities. Then, another day, Laurel and Karl had gone to try to play with him, but Hudson didn’t have the energy to get up, so they lay on the floor beside him, resting their hands on his golden coat, and told him stories of fun times they had had with him. When Bud got home from digging the grave, he showered and we headed out to a wedding. 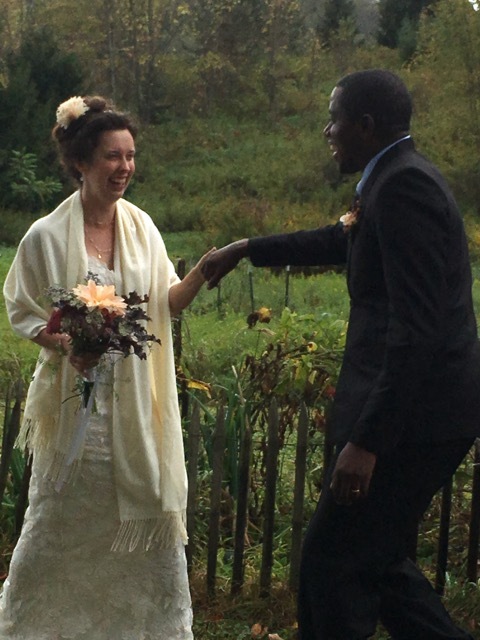 I had never been to a Quaker wedding before, but it was lovely. Lots of silence. At the beginning of the service a man explained the proceedings. We would sit in silence until the bride and groom were ready to say their vows. Then, they would stand and say their vows to each other — no minister. More silence would follow, but friends and family were invited to share any words they wanted with the bride and groom. The service would end when we all held hands, an act initiated by one designated person, the person who was explaining it all to us. Then, he said something like, “Please allow some silence between sharing your words to allow the words of the previous person to settle.” I pictured watering my plants and how the water sometimes waits at the surface before seeping into the soil. That’s how it should be at every service, I thought. Lots of children were present. Little Augie, a few rows ahead of us, blew kisses at us, and said, “Da-da-da-da.” I think it was his new word. The little girl behind us identified pictures in a board book. Across the aisle, a baby cried, was soothed, and fell asleep. Yet, in the midst of all that, there was silence. When the bride and groom stood to say their vows to each other, each one’s voice started quietly. We strained our ears to hear, but, as their words went on, they became stronger, clearer. It was obvious that they believed deeply in these vows, a proclamation of their love and commitment to each other. I could go on and on — about the wedding, the reception, and visiting with dear friends. We had a wonderful time. But, back at my brother’s house, the vet tech came to euthanize Hudson. When we got home from the wedding, Bud headed back to my brother’s. He told me later how tenderly my brother and his wife had laid Hudson in the hole, covering him with a blanket. They put some of his favorite toys in with him. Bud told them that he would finish filling the grave with dirt for them and that he would do it gently. Although my heart was full from the wedding, it ached for my brother. This past week, for the third time in little over three years, I held a box with the cremains of a family member. My brother-in-law’s ashes arrived in a cardboard box that I kept briefly here before passing them on to another family member. In the midst of life, we are in death. In the midst of death, we are in life. I’m thankful for the wedding — a shiny bit of joy to balance the darkness. I’m thankful that my brother-in-law is finally at peace. And I’m thankful for a dog, who did everything a dog is supposed to do for his master, serving as a trusted friend and companion. I can talk about my husband who has been gone for just three years, and my little friend who I came to know and spend time with before she died, but I found her dead not quite two weeks ago. But it’s stories about dogs that never fail to bring me to tears. My own dogs I’ve loved and lost, and this dog that I didn’t know. I don’t know why. That’s so true. I was thinking about how hard this is for my brother. We lost my oldest brother to a heart attack over three years ago, and our mother died nearly two years. 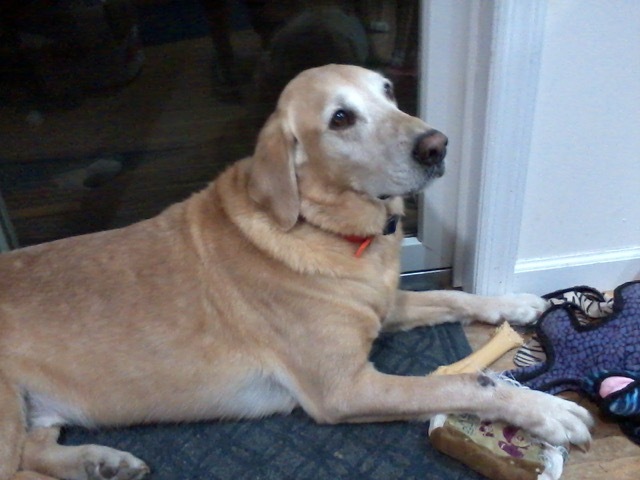 Those deaths were sad and we grieved deeply, but something about him losing this dog absolutely breaks my heart. Oh, dear.. I’m so sorry all the way around. ❤ Perhaps people and animals know, at this time, that there are other loved ones coming along to their loved ones, and it gives them a peace to which they don't or can't give voice. Perhaps our tears in parting only speed up the arrivals. I hope so. Again, I'm so sorry for your family's losses. The loss of a pet can hit us as hard, perhaps even harder, than that of a family member. I read this the other day. Not in a good space and I deferred commenting. I am back. My cousin married a Quaker. I attended the wedding aged, I suppose 13. It moved me beyond anything that had ever moved me in my life. Simplicity and quiet suddenly became my need. And they remain so. Your brother’s dog. Oh our canines – the payback for the unquestioning devotion they give us is their shorter time on this earth and our inevitable grief. I am glad you and your family were able to help in some way. Dog loss is the loss of a part of self.